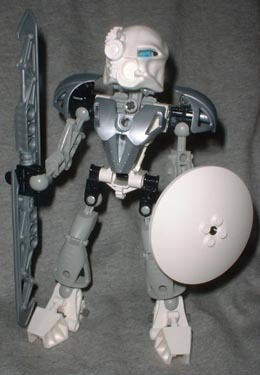 I made no secret of the fact that Kopaka was my favorite among the original Bionicle line. He was the first one I bought, despite being the last one I found. The ice guy was just that cool. His coolness translates well to the Nuva version. The silvery armor blends well with Kopaka's grey limbs (more so than with the other Toa Nuva colors). Kopaka Nuva is constructed in nearly the same way as his predecessor: a big white torso, grey limbs, white feet and a white mask. He still has a system of gears in his shoulder to activate his weapon-slashing feature, though the set now includes extra gears and solid pieces so that you can also choose how you want to manipulate his arms. Want them both to move? Install an extra gear. Want them both stationary? You can do that, too. The figures weaponry has been updated - he's got a better shield, as well as a more ornate double-bladed sword that's nearly as tall as the figure. One of the new features with the Toa Nuva is that their weapons serve more than one purpose; mainly, they can turn into a means of transportation. 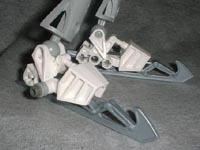 Plus Kopaka's swords into his feet, and you've got some swanky skis. Or, according to Bionicle.com, "his ice blade can be split in two to form power ice skates that let him rip through the ice and snow." Still, they look like skis to me. The protodermis armor is cast from a shiny silver plastic (which is actually a translucent plastic with metallic dye suspended within). Plugging into the shoulders and chest, the armor looks like nothing so much as football pads. The sword/skis are made of the same material. Even the Toa's masks have gotten upgraded. Looking much less technological than the original, Akaku Nuva still doesn't look very good. It allows the user and those close by to see through walls and discover that which is concealed by physical means or illusion. The multiple eyepieces have been replaced by one lens, but the rest of the mask is lumpy and malformed. It's been suggested that perhaps this was intended to represent packed snow, but that only works for the white version - collect any of the other five colors, and it's back to looking awful. Bionicle is continuing the tradition it began last year with fun toys and an engaging story. The Toa have been updated, but once again Kopaka is brought low by a silly kanohi. Of course, maybe that's for the best - without that impediment, he'd just be that much cooler than the rest. Do you like the Bionicles, or are you a complete bonehead? Who's your favorite? Tell us on our message board, the Loafing Lounge.